Ultramafic rocks (also referred to as ultrabasic rocks, although the terms are not wholly equivalent) are igneous and meta-igneous rocks with a very low silica content (less than 45%), generally >18% MgO, high FeO, low potassium, and are composed of usually greater than 90% mafic minerals (dark colored, high magnesium and iron content). The Earth's mantle is composed of ultramafic rocks. Ultrabasic is a more inclusive term that includes igneous rocks with low silica content that may not be extremely enriched in Fe and Mg, such as carbonatites and ultrapotassic igneous rocks. IUGS Classification diagram for intrusive ultramafic rocks based on modal percentages of mafic minerals. 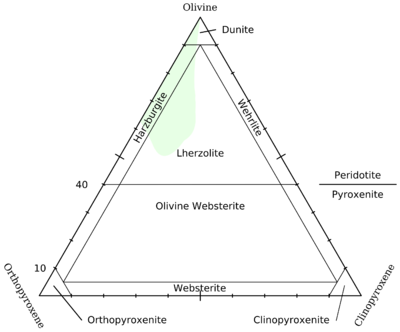 Green area represents typical mantle peridotite. Intrusive ultramafic rocks are often found in large, layered ultramafic intrusions where differentiated rock types often occur in layers. Such cumulate rock types do not represent the chemistry of the magma from which they crystallized. The ultramafic intrusives include the dunites, peridotites and pyroxenites. Other rare varieties include troctolite which has a greater percentage of calcic plagioclase. These grade into the anorthosites. Gabbro and norite often occur in the upper portions of the layered ultramafic sequences. Hornblendite and, rarely phlogopite, are also found. Volcanic ultramafic rocks are rare outside of the Archaean and are essentially restricted to the Neoproterozoic or earlier, although some boninite lavas currently erupted within back-arc basins (Manus Trough, New Guinea) verge on being ultramafic. Subvolcanic ultramafic rocks and dykes persist longer, but are also rare. There is evidence of ultramafic rocks elsewhere in the solar system. Examples include komatiite and picritic basalt. Komatiites can be host to ore deposits of nickel. Ultramafic tuff is extremely rare. It has a characteristic abundance of olivine or serpentine and a scarcity or absence of feldspar and quartz. Rare occurrences may include unusual surface deposits of maars of kimberlites in the diamond fields of southern Africa and other regions. Technically ultrapotassic rocks and melilitic rocks are considered a separate group, based on melting model criteria, but there are ultrapotassic and highly silica-under-saturated rocks with >18% MgO which can be considered "ultramafic". Ultrapotassic, ultramafic igneous rocks such as lamprophyre, lamproite and kimberlite are known to have reached the surface of the Earth. Although no modern eruptions have been observed, analogues are preserved. Most of these rocks occur as dikes, diatremes, lopoliths or laccoliths, and very rarely, intrusions. Most kimberlite and lamproite occurrences occur as volcanic and subvolcanic diatremes and maars; lavas are virtually unknown. Vents of Proterozoic lamproite (Argyle diamond mine), and Cenozoic lamproite (Gaussberg, Antarctica) are known, as are vents of Devonian lamprophyre (Scotland). Kimberlite pipes in Canada, Russia and South Africa have incompletely preserved tephra and agglomerate facies. These are generally diatreme events and as such are not lava flows although tephra and ash deposits are partially preserved. These represent low-volume volatile melts and attain their ultramafic chemistry via a different process to typical ultramafic rocks. Metamorphism of ultramafic rocks in the presence of water and/or carbon dioxide results in two main classes of metamorphic ultramafic rock; talc carbonate and serpentinite. Talc carbonation reactions occur in ultramafic rocks at lower greenschist through to granulite facies metamorphism when the rock in question is subjected to metamorphism and the metamorphic fluid has more than 10% molar proportion of CO2 (carbon dioxide). When such metamorphic fluids have less than 10% molar proportion of CO2, reactions favor serpentinisation, resulting in chlorite-serpentine-amphibole type assemblages. The majority of ultramafic rocks are exposed in orogenic belts, and predominate in Archaean and Proterozoic terranes. Ultramafic magmas in the Phanerozoic are rarer, and there are very few recognised true ultramafic lavas in the Phanerozoic. Many surface exposures of ultramafic rocks occur in ophiolite complexes where deep mantle-derived rocks have been obducted onto continental crust along and above subduction zones. Serpentine soil is a magnesium rich, calcium, potassium and phosphorus poor soil that develops on the regolith derived from ultramafic rocks. Ultramafic rocks also contain elevated amounts of chromium and nickel which may be toxic to plants. As a result, a distinctive type of vegetation develops on these soils. Examples are the ultramafic woodlands and barrens of the Appalachian mountains and piedmont, the "wet maquis" of the New Caledonia rain forests, and the ultramafic forests of Mount Kinabalu and other peaks in Sabah, Malaysia. Vegetation is typically stunted, and is sometimes home to endemic species adapted to the soils. Often thick, magnesite-calcrete caprock, laterite and duricrust forms over ultramafic rocks in tropical and subtropical environments. Particular floral assemblages associated with highly nickeliferous ultramafic rocks are indicative tools for mineral exploration. Weathered ultramafic rocks may form lateritic nickel ore deposits. Ultramafic lava may have been detected on Io, a moon of Jupiter, because heat-mapping of Io's surface found ultra-hot areas with temperatures in excess of 1,200 °C (2,190 °F). The lava immediately below these hots spots is probably about 200 °C (360 °F) hotter, based on surface-to-subsurface temperature differences observed for lava on Earth. A temperature of 1,400 °C (2,550 °F) is thought to indicate the presence of ultramafic lava. Mercury also appears to have ultramafic volcanic rock. Ultramafic rock types: Peridotite, dunite, norite, essexite, komatiite. ^ Ballhaus, C.G. & Glikson, A.Y., 1995, Petrology of layered mafic-ultramafic intrusions of the Giles Complex, western Musgrave Block, central Australia. AGSO Journal, 16/1&2: 69-90. ^ Lesher, C.M., Arndt, N.T., and Groves, D.I., 1984, Genesis of komatiite-associated nickel sulfide deposits at Kambalda, Western Australia: A distal volcanic model, in Buchanan, D.L., and Jones, M.J. (Editors), Sulphide Deposits in Mafic and Ultramafic Rocks, Institution of Mining and Metallurgy, London, p. 70-80. ^ "Space Volcanoes". Horizon (Series 54, Episode 6). BBC. 7 July 2018. Retrieved 6 March 2019.